This article covers sale orders creation within Stock&Buy. To create a sales order click go to the Sales page and click on New sales order. This will create a draft sale order and bring you to order details page. The order details view is a page where you can view all details related to a sale order. 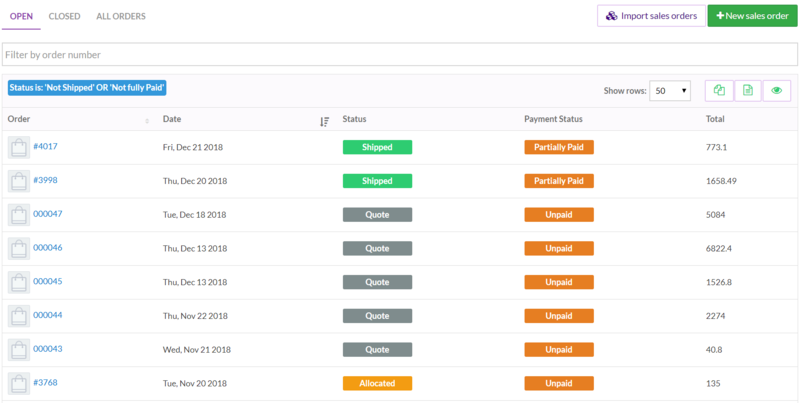 The page has two sections, a main pane where the order line items are displayed and a secondary pane located on the right hand side of the screen where you can perform various actions on the sale order. Stock&Buy will automatically populate the order line item prices from the retail price list if the customer’s business type is retail. It will bring up the wholesale price otherwise. Hit the Save button to save your order. Every sale order in Stock&Buy goes through 4 stages. Quote, Allocated, Invoiced and Shipped. The table below outline each order status and the different actions which can be taken at each stage. Quote The order has no impact on stock levels at this stage. All quantities in the order are allocated. The total inventory levels remains unchanged as the items sold are still on your warehouse. The available stock levels are decreased as a result of the allocations. This is to avoid double-selling your products. Check out this article for more details about total, allocated and available stock. Changed – add, update or remove extra charges. Invoiced No stock level changes at this stage apart from those made in the Allocated stage above. This is the final stage of a sales order life cycle. A sale order is meant to be set to this state when the goods are shipped out of your warehouse. At this stage, the system releases inventory allocations and decreases the total inventory.